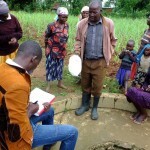 Most of the Lutinye people are Christians who go to different churches like the Friends Church, Seventh Day Adventist (S.D.A) Church, Catholic Church, Salvation Army Church and PEFA Church. 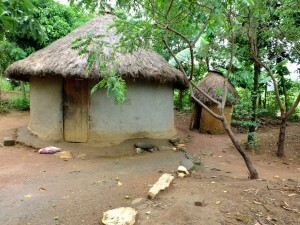 Due to the level of poverty in this community, most children go to a public primary school called Shirongo Primary School or St. Martine Secondary School. 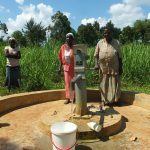 The need in Lutinye Community was introduced by the chief who sadly passed away last year before he could see this project implemented. 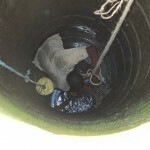 Locals get their water from the well that needs repair. 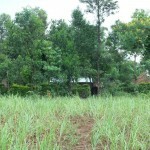 It was dug in 1987 by the Kenya Finland Company. 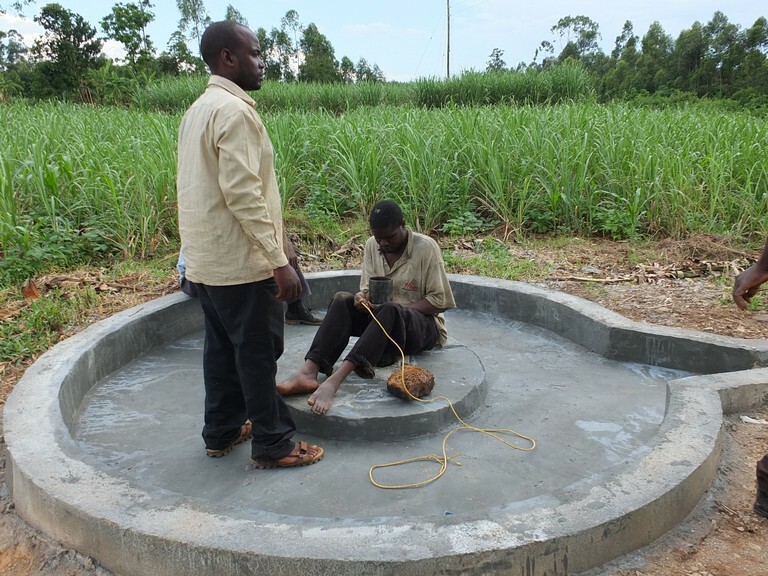 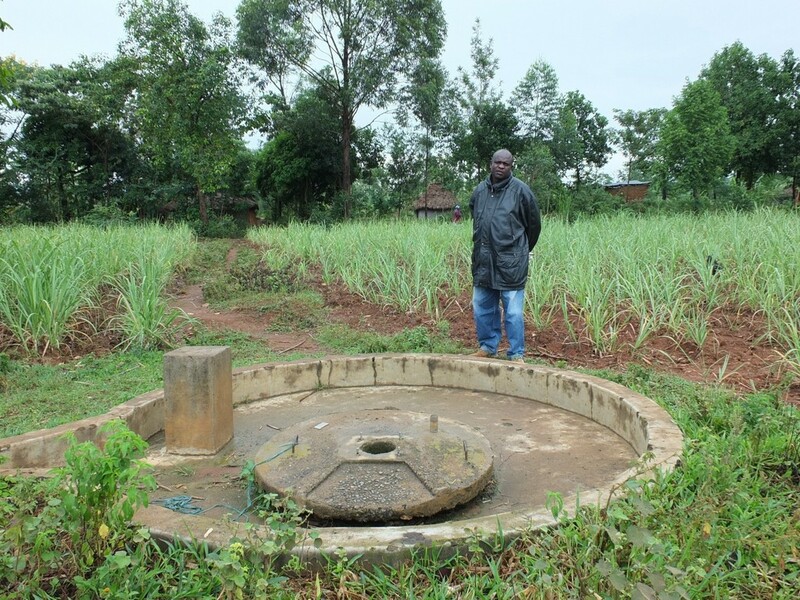 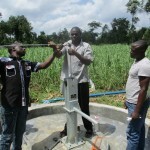 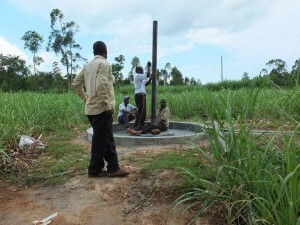 Unfortunately, the hand-pump installed on this well was stolen far before it could benefit the community. 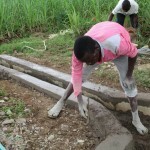 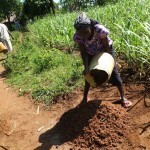 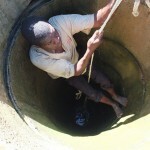 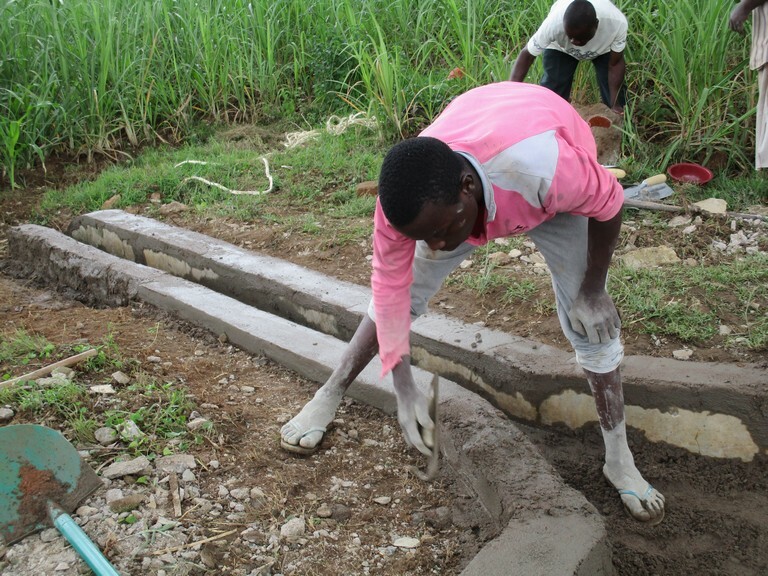 Ever since community members can remember, they have been accessing water directly from the hole that was dug. 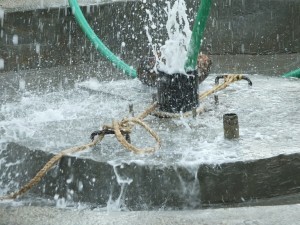 Without a well pad and working pump, the water inside is open to contamination; contamination such as surface runoff, animal activity, and the bucket tied to a rope that is used to draw. 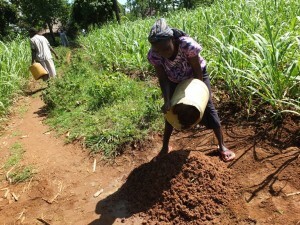 The women or children will bring either clay pots or 20-liter jerrycans to carry the water they draw. 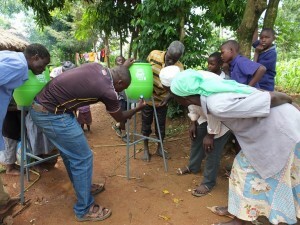 These containers do not have covers, and are brought back home and kept in the kitchen until more water is needed. 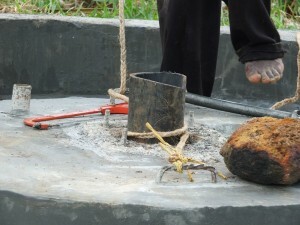 Even though it would seem obvious that water is unfit for drinking, surveys revealed that community members do not know to treat water by boiling or chlorinating. 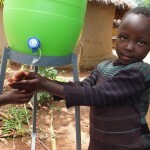 Because of this, outbreaks of waterborne disease like typhoid and diarrhea have been reported. 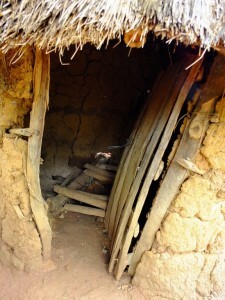 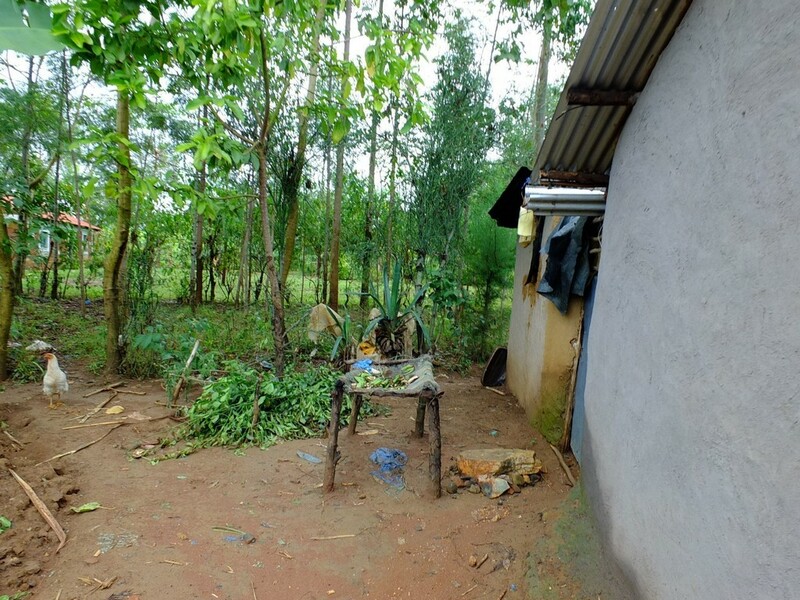 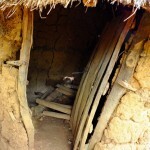 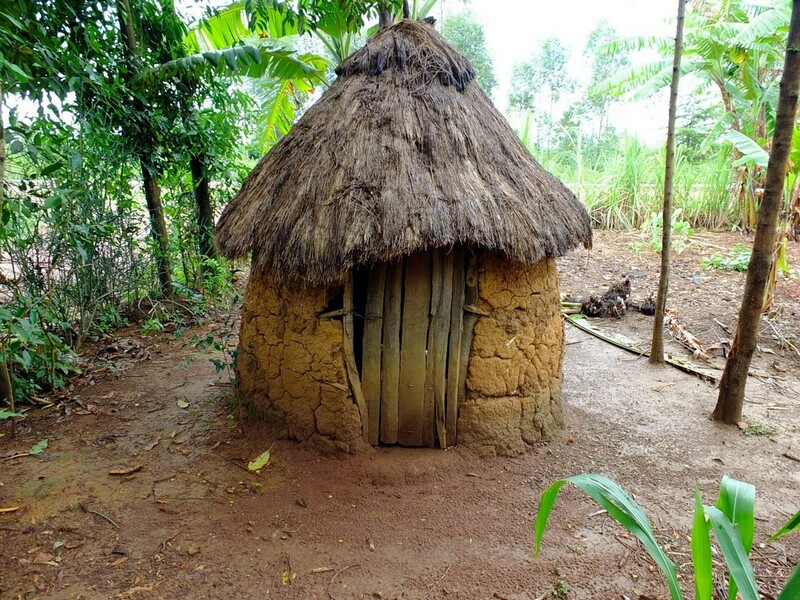 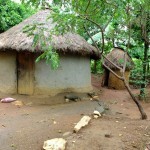 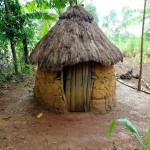 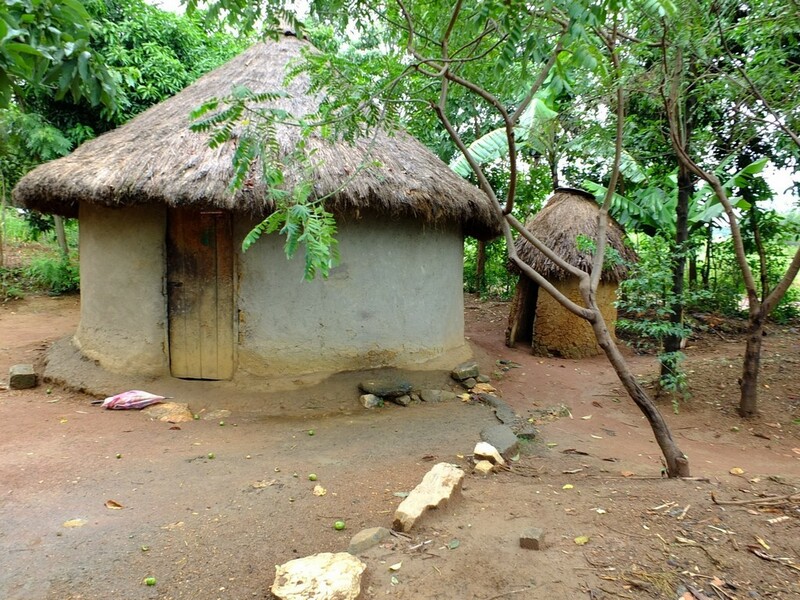 Over 75% of households report to have pit latrines, but most of these lack privacy without doors. 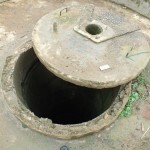 There is also a noticeable odor because the holes need to be covered. 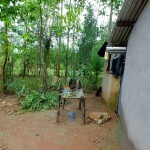 However, open defecation was not observed to be an issue in this area. 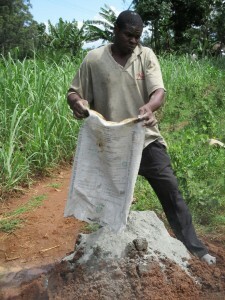 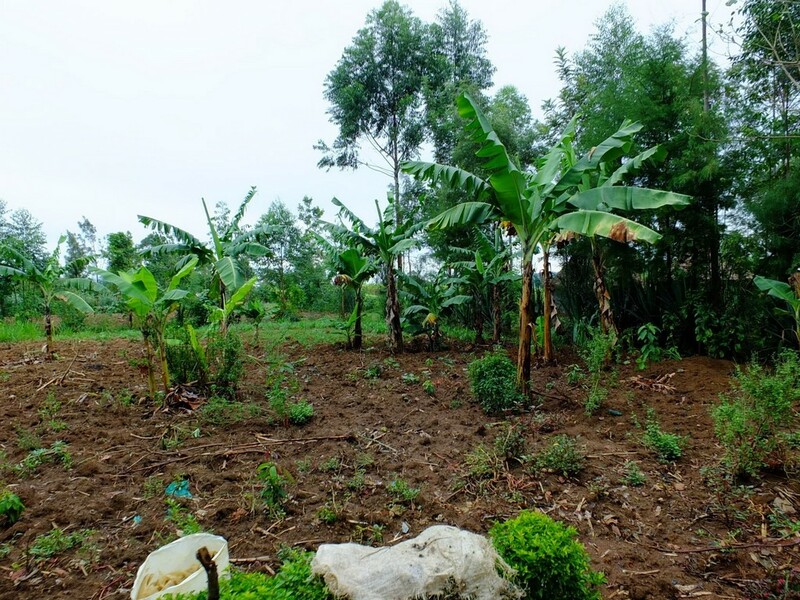 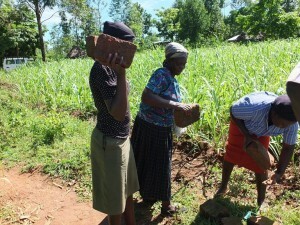 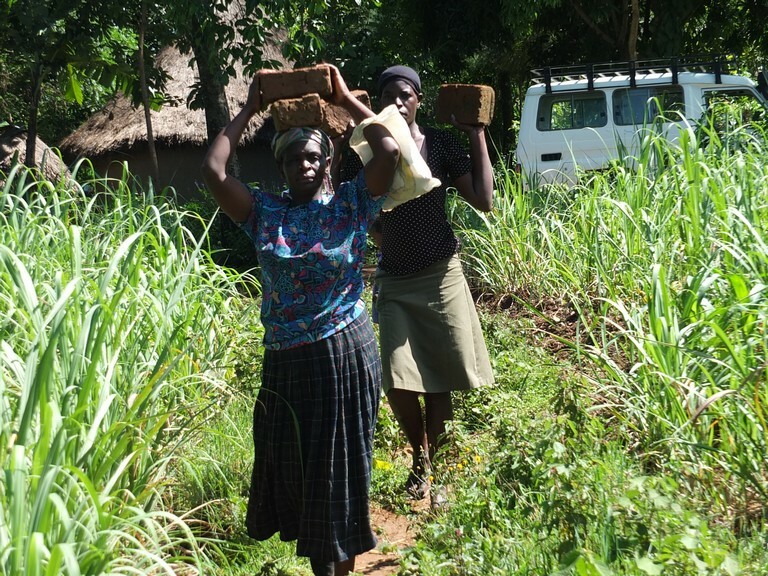 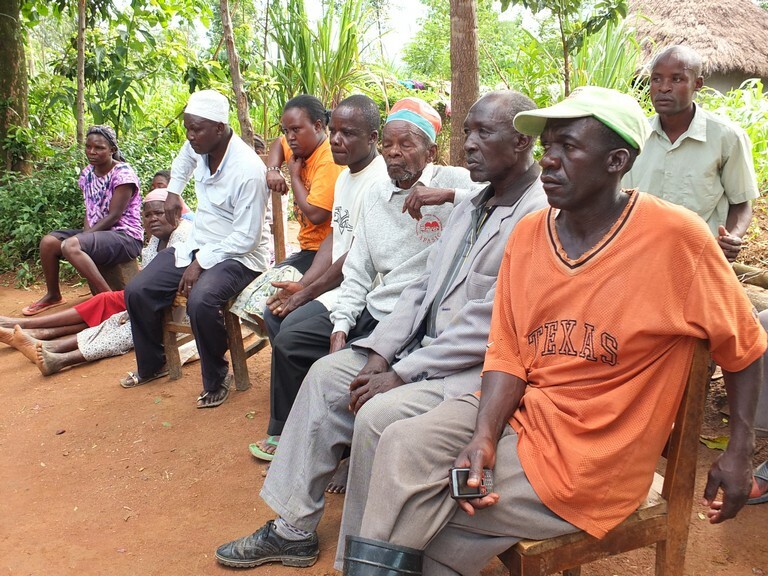 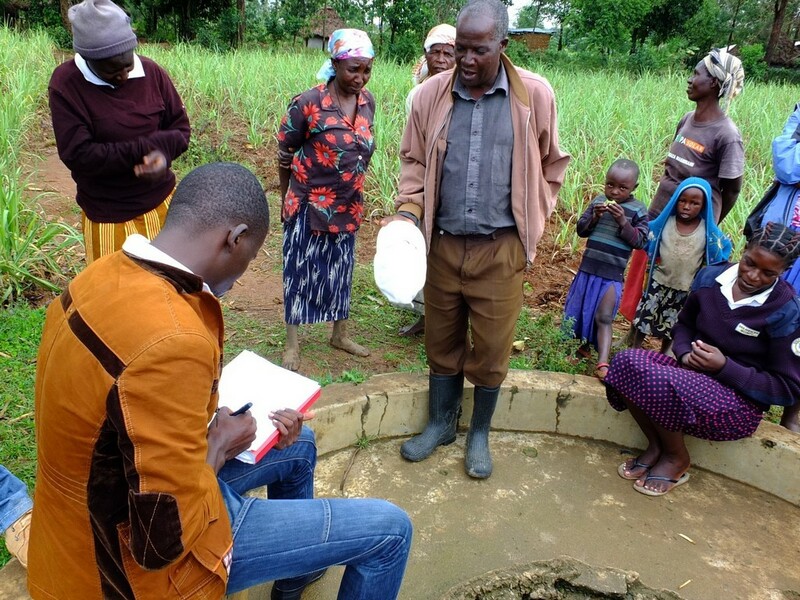 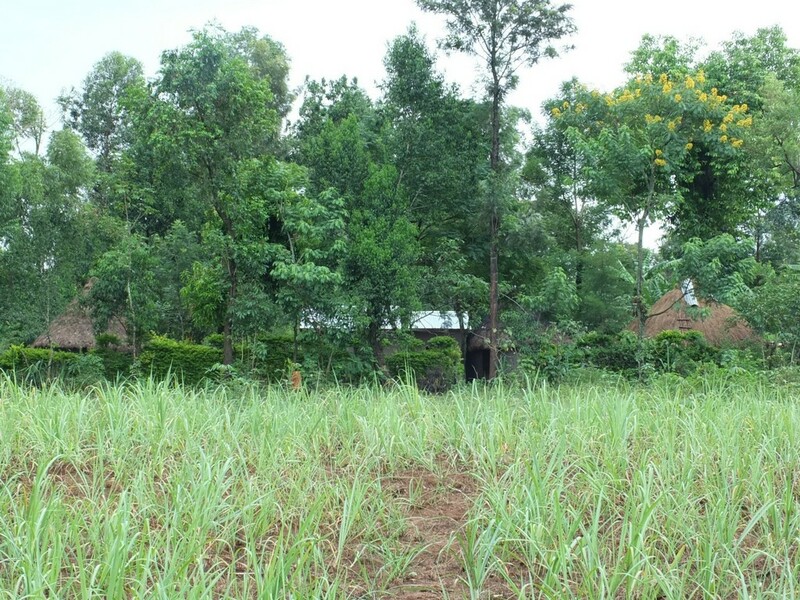 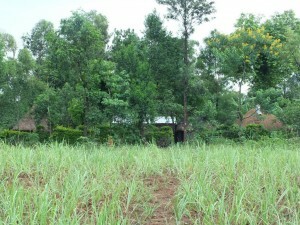 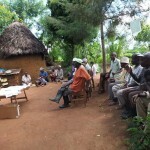 According to Farmer Shikuku Mwalakha, “The hygiene condition is not good in this area because most homes need more trainings on proper hygiene and sanitation.” The community is ready and willing to participate in upcoming hygiene and sanitation training from which they should greatly benefit. 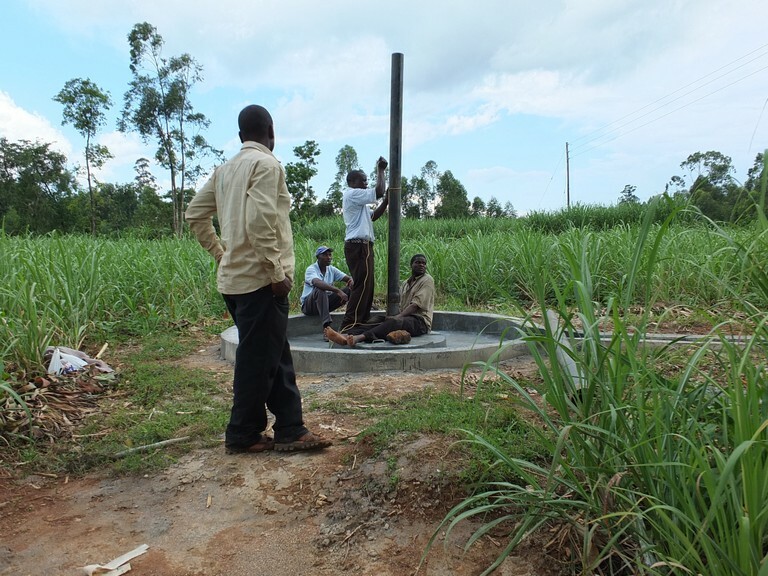 People are very excited for this project, and have promised that they will do everything in their power to maintain a renewed water source. 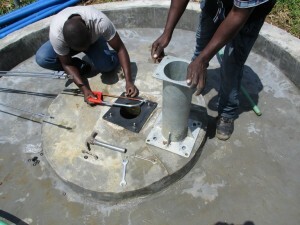 They are forming and preparing a water user committee that will oversee well management and maintenance. There is great hope that a rehabilitated well will restore both health and time to Lutinye’s people! 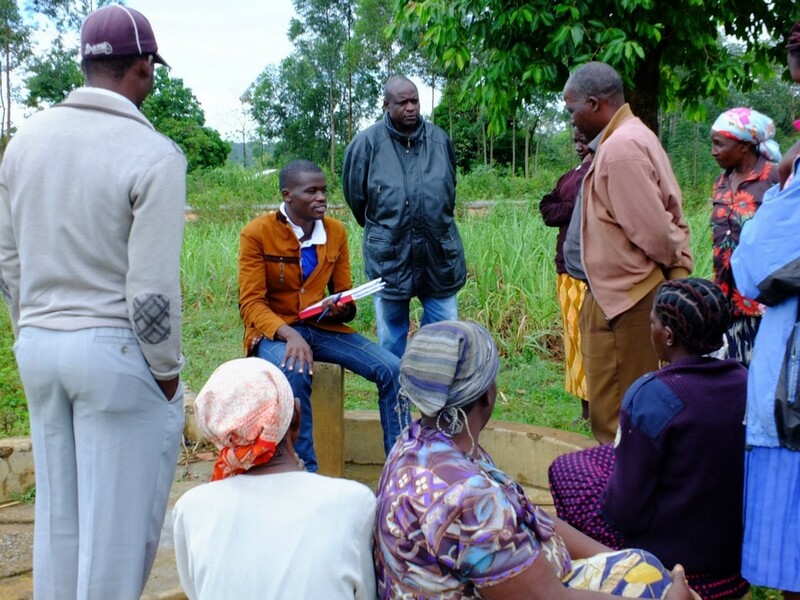 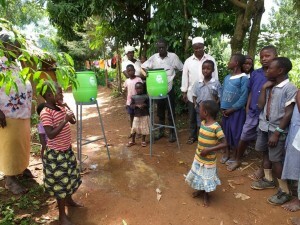 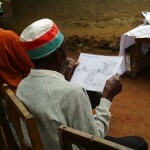 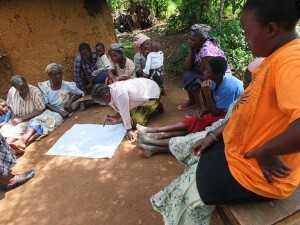 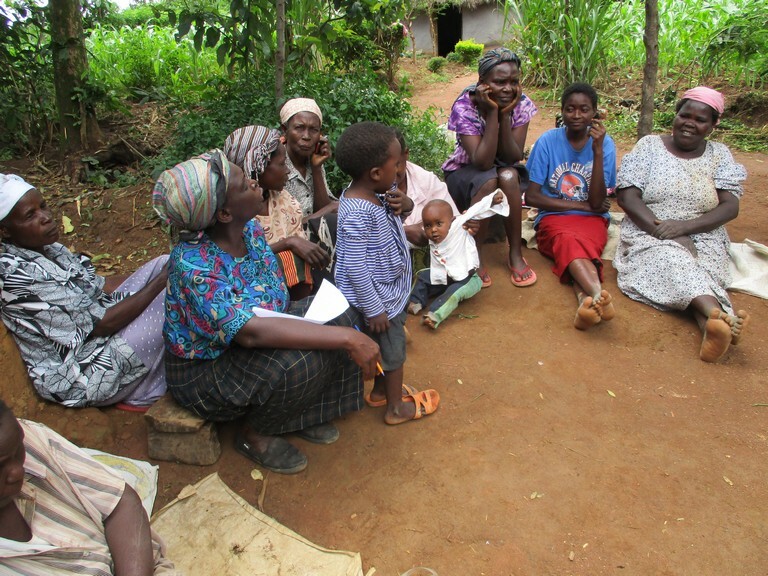 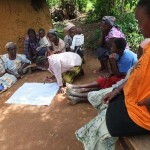 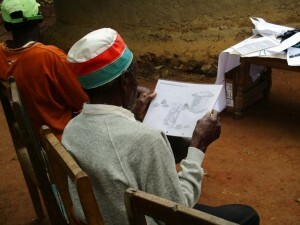 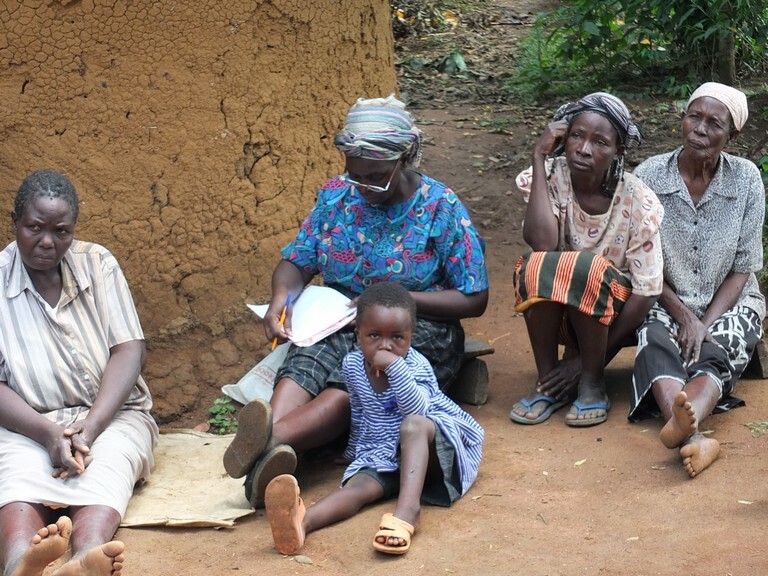 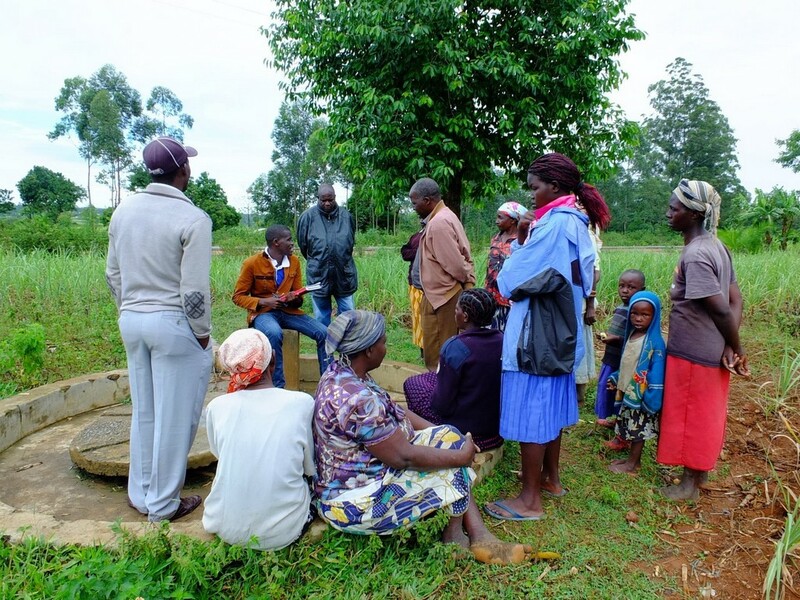 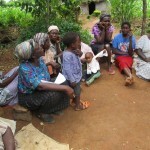 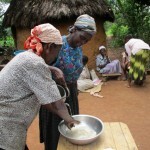 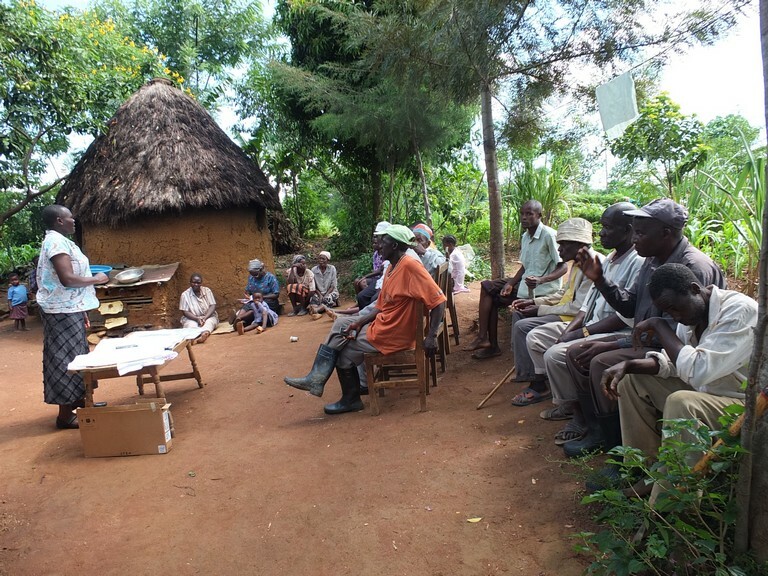 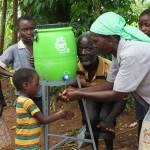 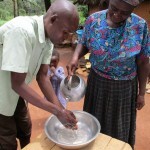 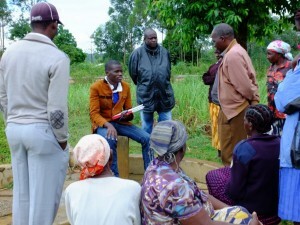 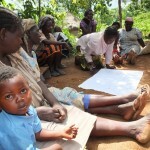 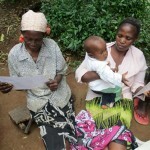 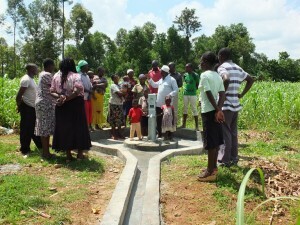 The training was held in the home of one of the community members neighboring the water point. 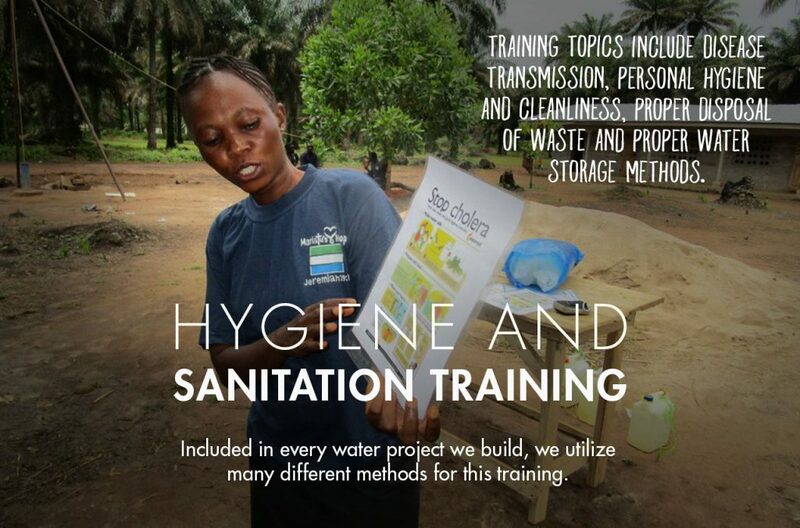 The training was planned based on the specific training needs identified during the baseline study in the community. 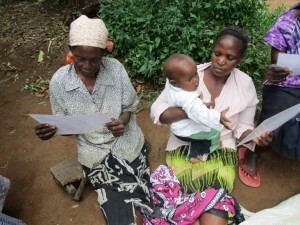 The participants were selected from each beneficiary household where at least one member from each household was to attend. 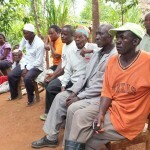 The meeting was attended by both men and women from the community. 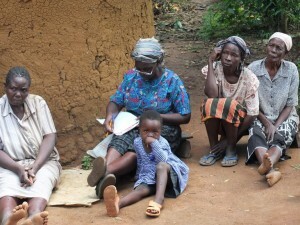 The attendance was average with most households is set to benefit being represented. There were more women than men in the training sessions. 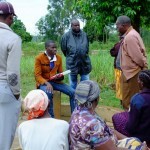 The community members actively participated in the training exercise by asking and answering questions. 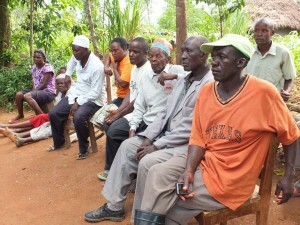 There was delay in arrival but the attendance improved steadily with time. 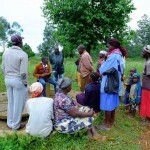 The training sessions included role playing, group discussions, demonstrations, and opportunities to ask and answer questions. 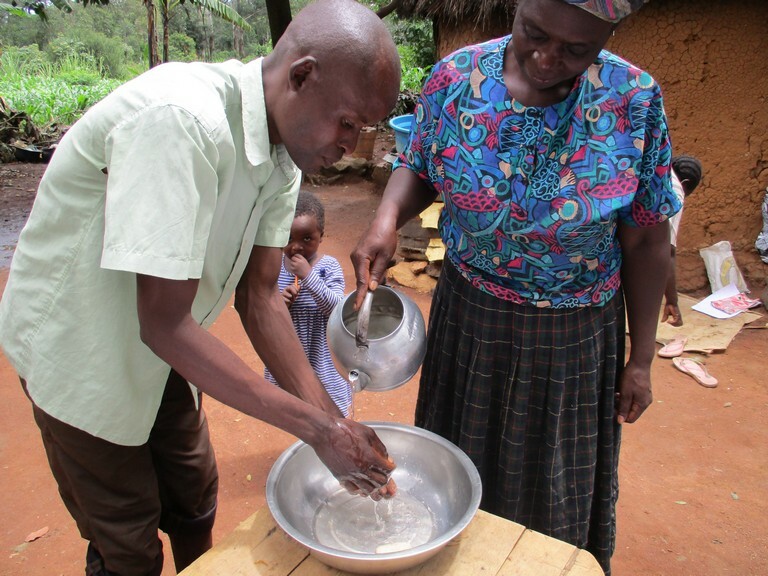 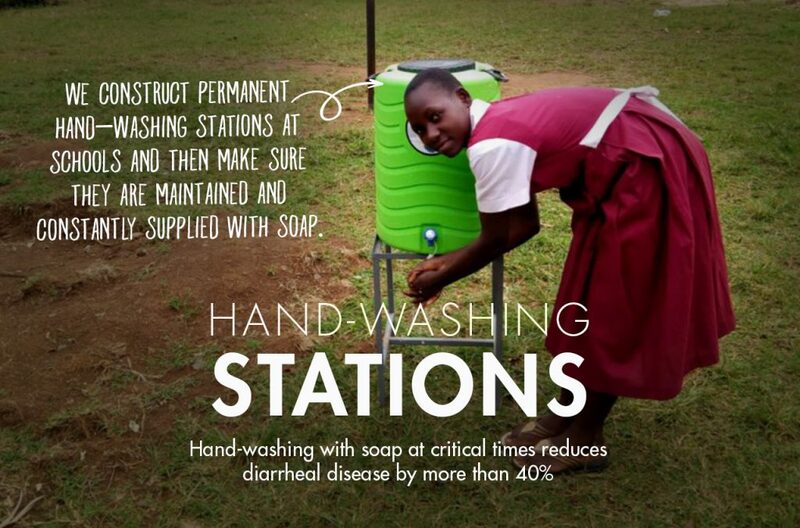 Emphasis was placed on the difference between good and bad hygiene practices, and disease transmission routes. 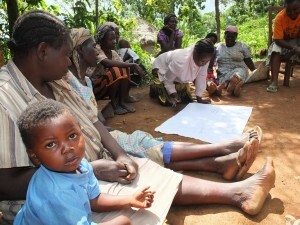 At the conclusion of the training, the community members set targets that they will be working to achieve. 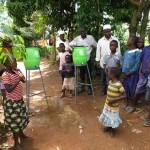 These include ensuring that all members have sanitation facilities and are fully utilized and will ensure the water point is secure and clean. 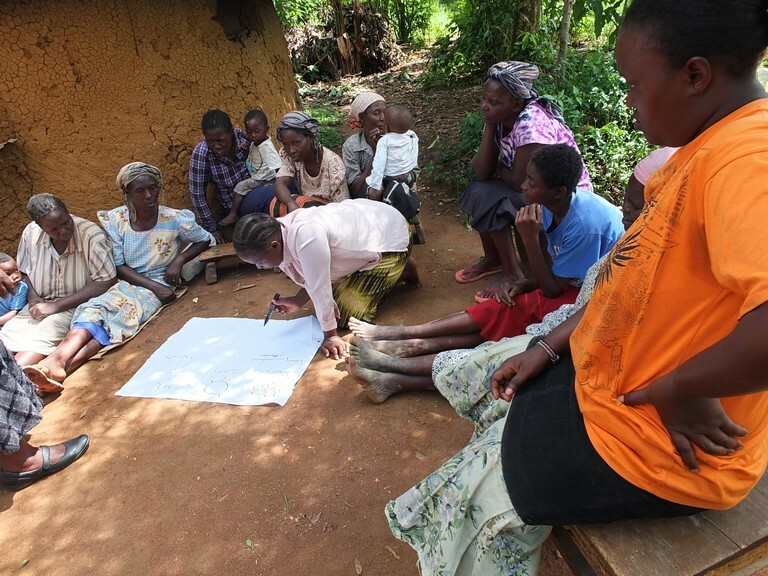 The training was a success since the community members present all agreed to behavior change and set several targets for themselves. The existing well had a worn out well pad. The construction process began by scrabbling of the old surface of the existing well pad leaving exposed bricks that were used previously. 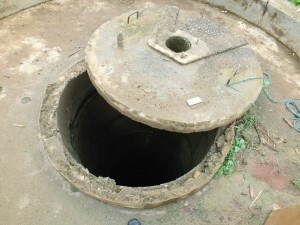 The cover of the shallow well was removed giving room for leveling of the broken top edges of the culvert lining. 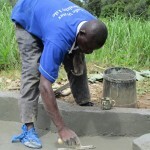 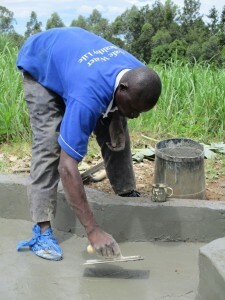 This was followed by plastering of the pad by applying a mixture of cement and sand. 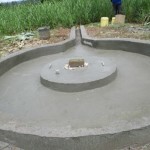 The finishing of the well pad was done by lining the plastered well pad with a coat cement mixed with waterproof cement. 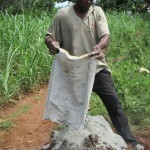 This was then left to dry for several days. 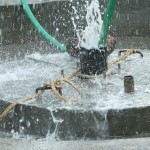 The well development (flushing) was done using a compressor on site to clean the well. 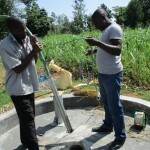 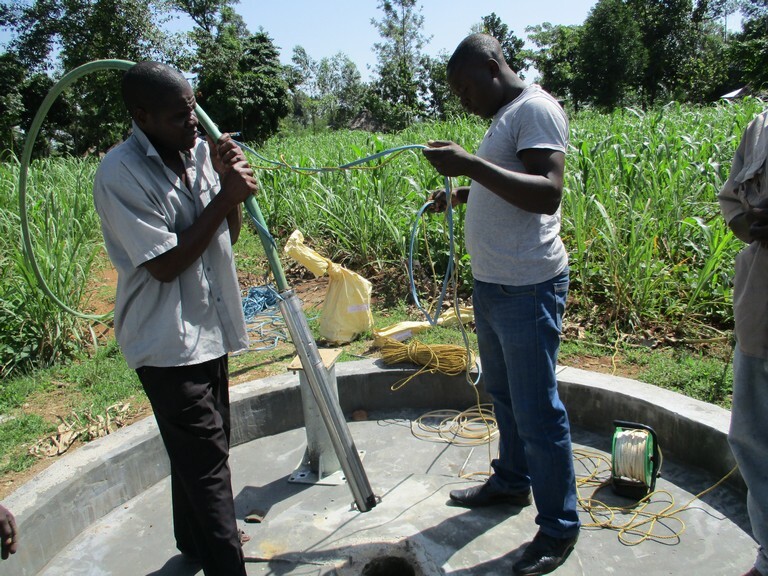 Test pumping of this well was conducted using a submersible pump. A constant rate test was used where pumping was done at a constant discharge over a period of time. 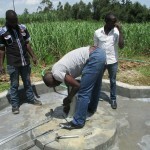 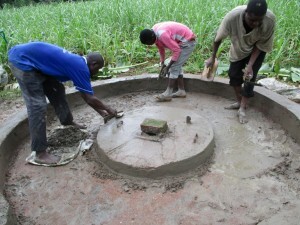 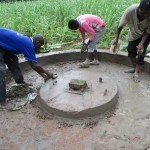 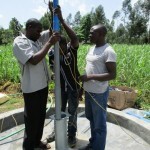 Pump installation was done by fitting an Afridev pump base. This was followed by installing the riser main PVC pipes fitted with a cylinder at the bottom end. These were then fitted with anchor ropes and lowered into the well to the desired depth and later tied onto the steel plate on the pump head. 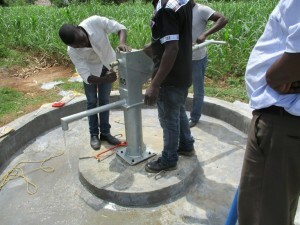 Rods were fitted with a plunger at the bottom end and lowered, handle placed and cover fitted onto the pump head. 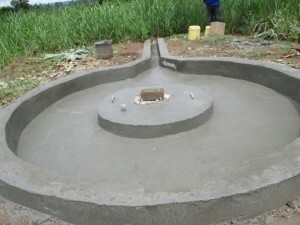 The community contributed sand used during the pad construction and tools used in the process. 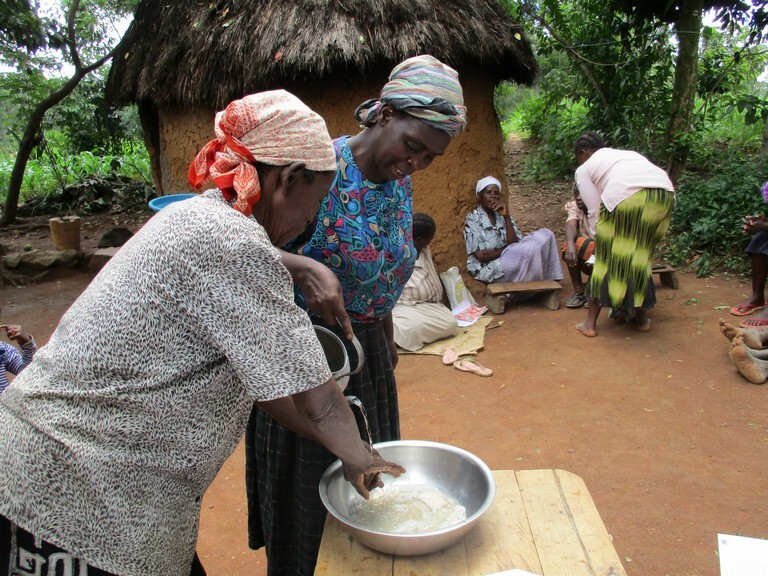 The community members prepared meals for the implementation team during the construction process. 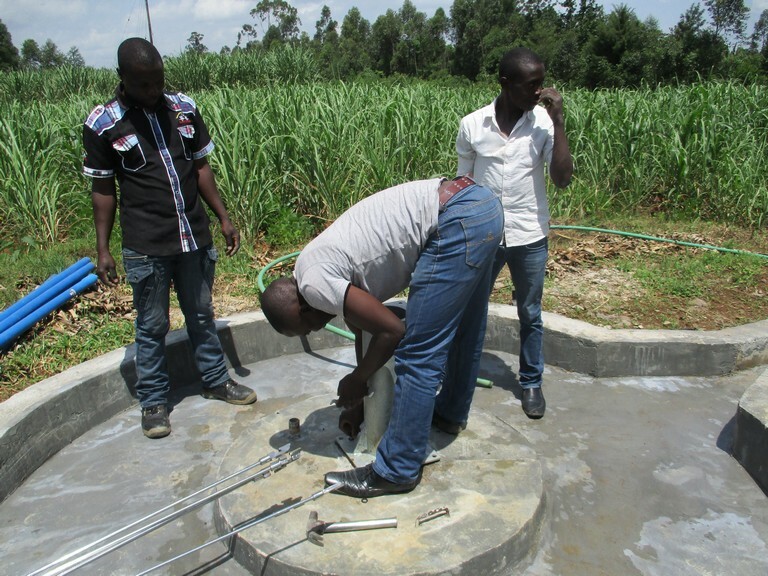 Storage space for materials, tools and equipment was provided by a community member for easy accessibility during the implementation process. 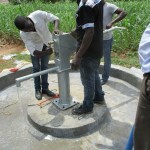 A few challenges were faced during the implementation of this project. 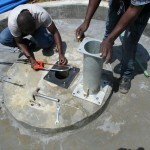 There were delays caused by the delivery of incomplete pump parts thus forcing the work to be delayed. 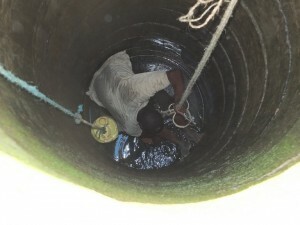 The weather conditions were a major challenge to the implementation team as heavy rainfall interrupted work. But with perseverance, the project is a success. 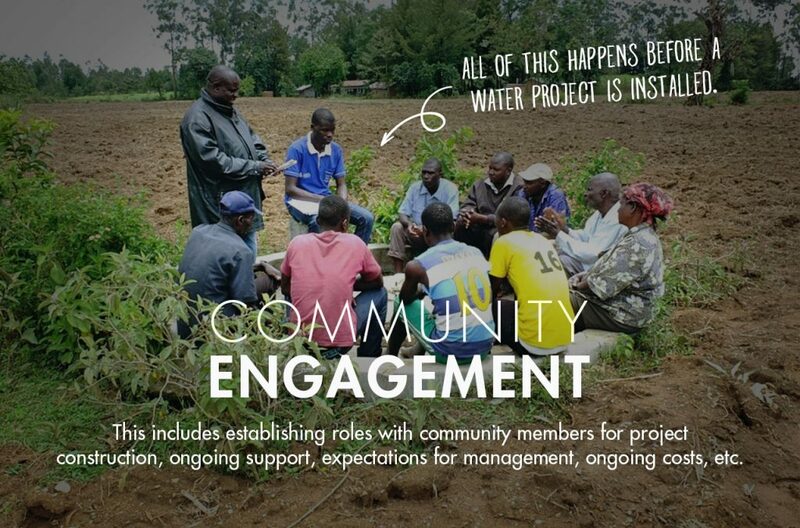 The community formed a Water User Committee that is responsible for the operations and maintenance of the project. 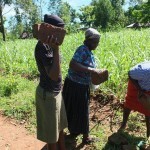 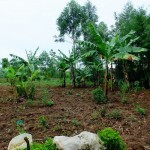 The community will contribute a fee that is aimed at sustaining the project. Our partner will provide constant and regular monitoring to ensure the project is functional at all times and will provide technical assistance through their Operations and Maintenance team in case of breakdowns. 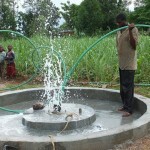 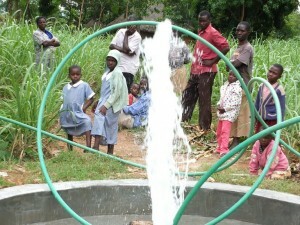 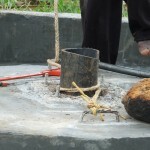 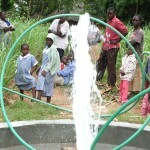 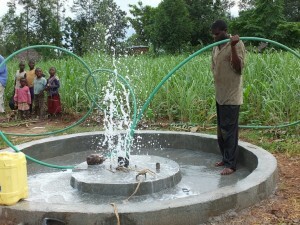 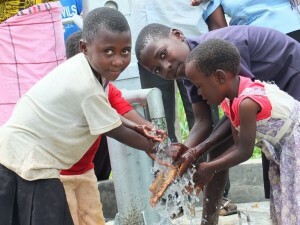 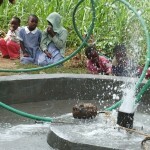 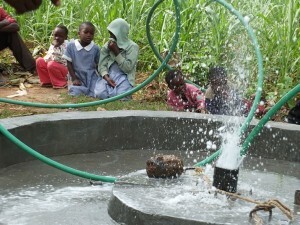 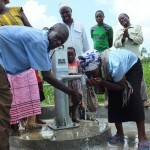 The community came together on the day the well was handed over. SAWASHI joined as an organization and officially commissioned the project and handed it over to the management committee to oversee its operation and maintenance. Leaders from SAWASHI gave a brief talk to the members gathered around. 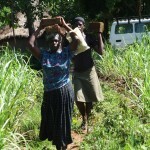 Representatives from the community gave a vote of thanks and expressed the community members joy. 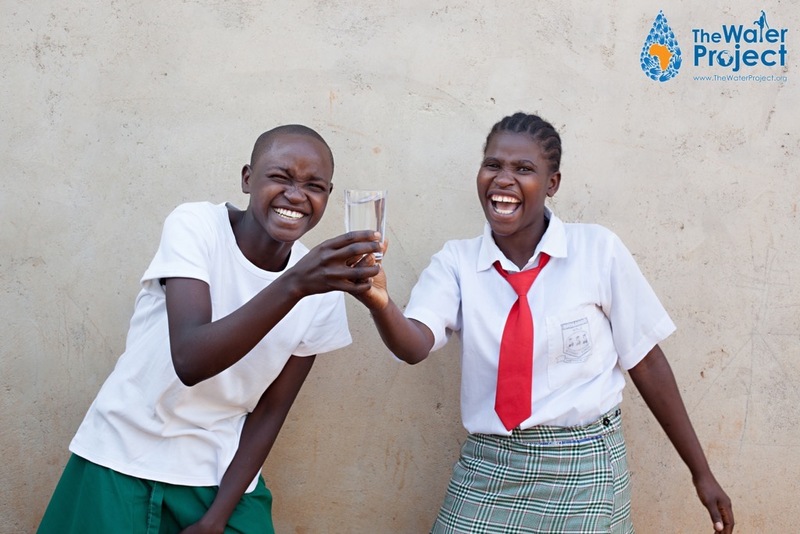 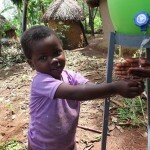 Lutinye community has a reason to smile again after a very long time searching for safe and quality water. The community appreciates the assistance accorded to them by rehabilitating their well. 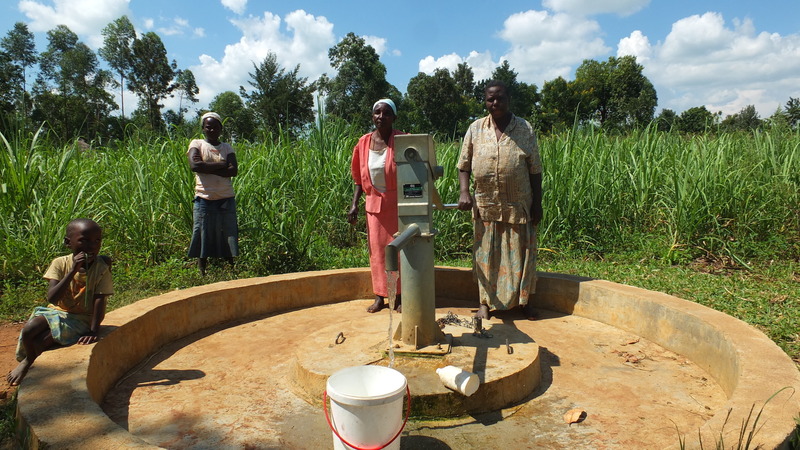 They promised to commit their efforts together to ensure their water point is safe and well maintained. They are happy to have lessons of hygiene and sanitation practices that are going to improve their hygiene status. 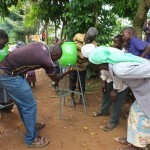 They resolved to maintain proper hygiene and sanitation to minimize the outbreak of diseases. 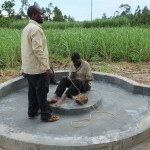 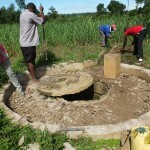 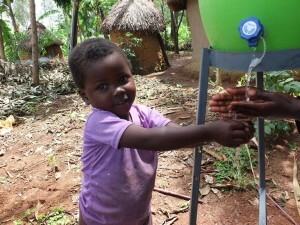 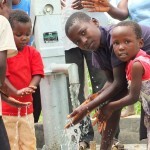 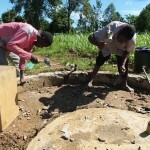 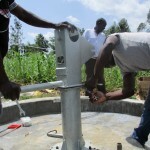 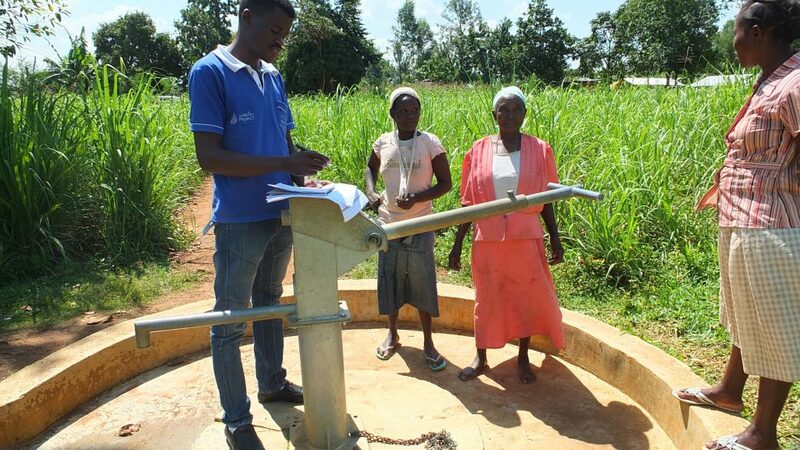 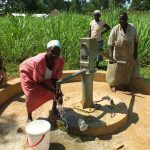 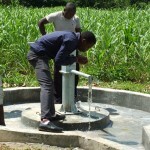 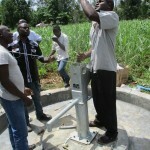 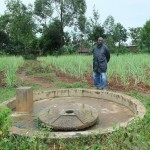 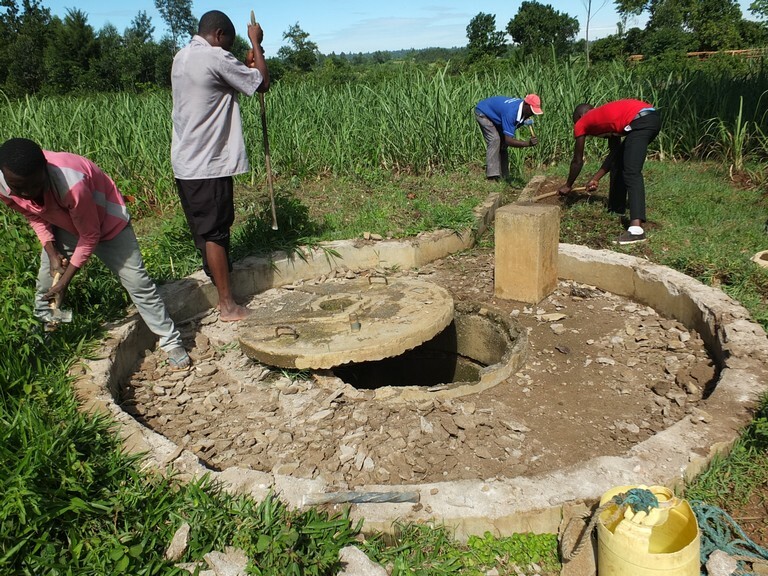 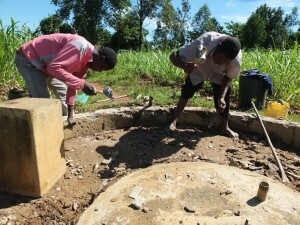 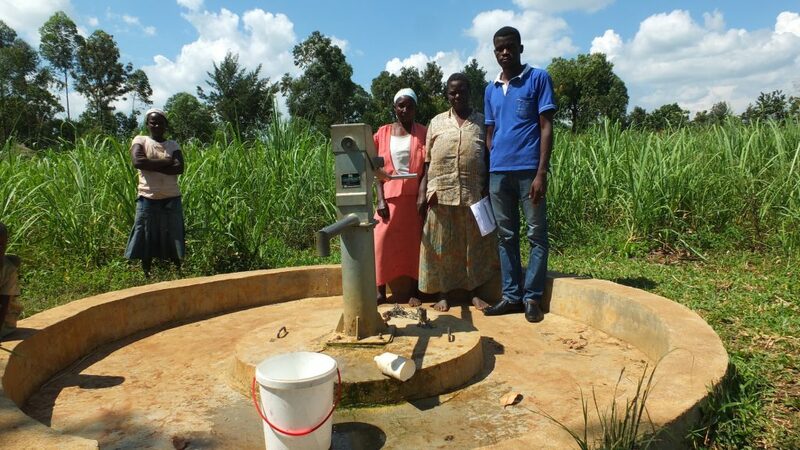 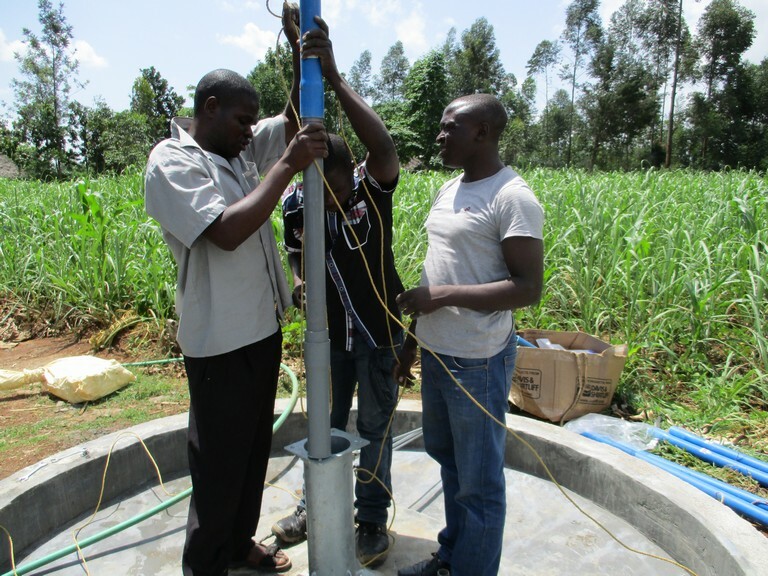 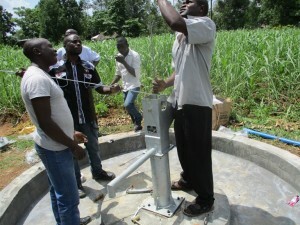 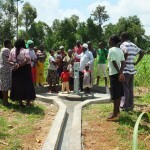 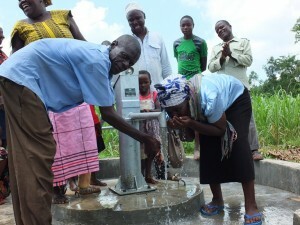 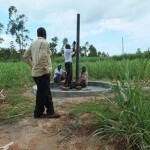 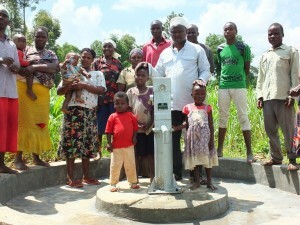 A year ago, generous donors helped rehabilitate a well with the Lutinye Community in Western Kenya. Because of these gifts and contributions from our monthly donors, partners can visit project sites throughout the year, strengthening relationships with communities and evaluating the actual water project. These consistent visits allow us to learn vital lessons and hear amazing stories – we’re excited to share this one from our partner, Paul Weringa, with you. 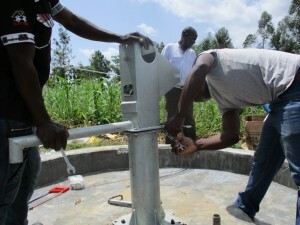 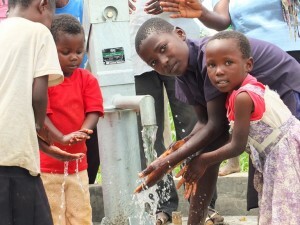 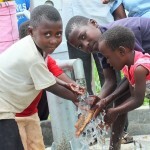 We are excited to report that the project to bring clean water to Lutinye community is complete. 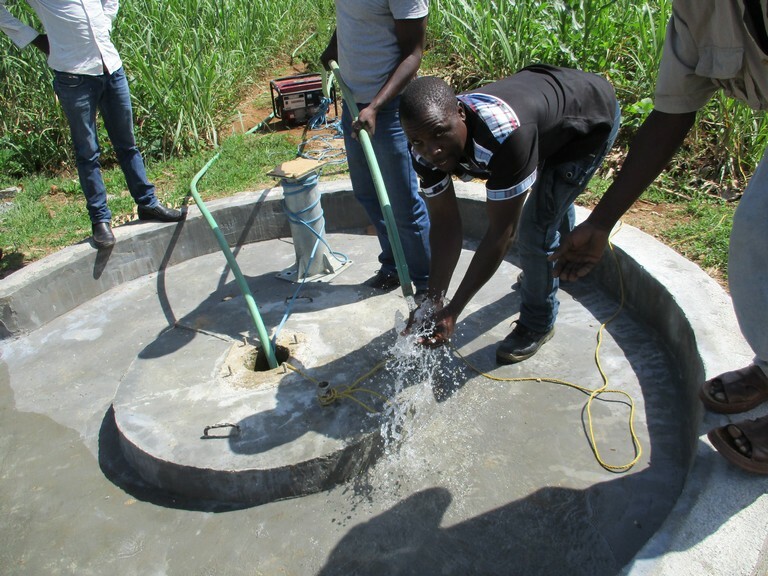 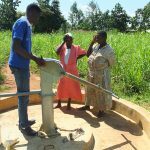 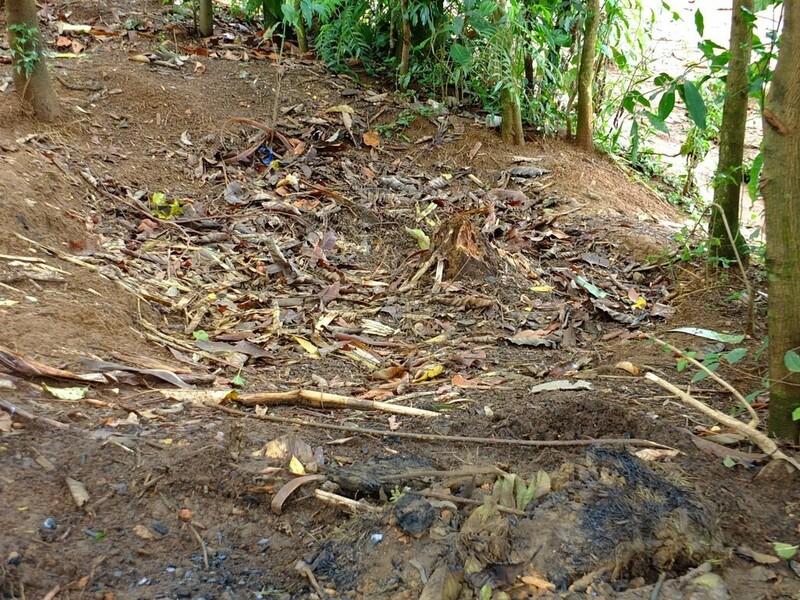 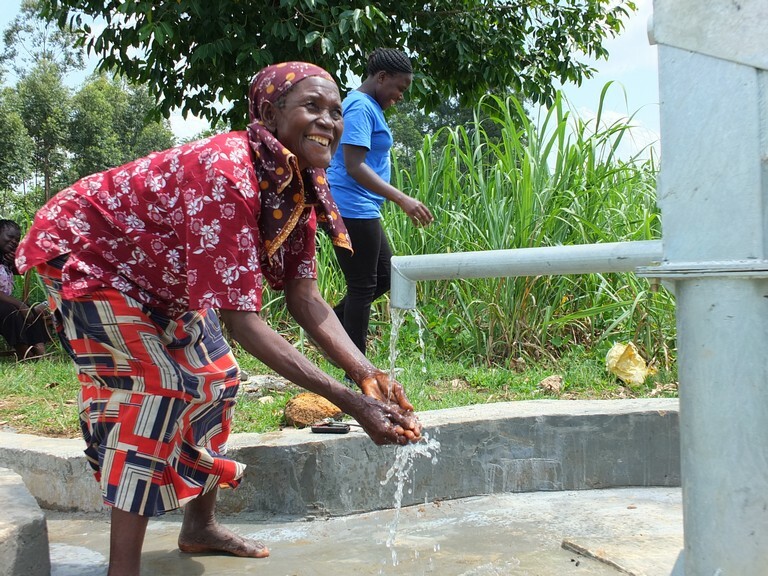 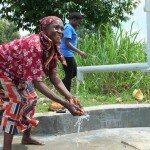 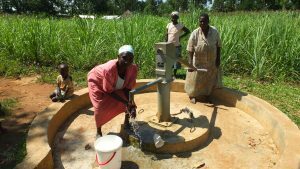 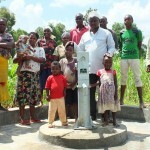 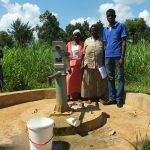 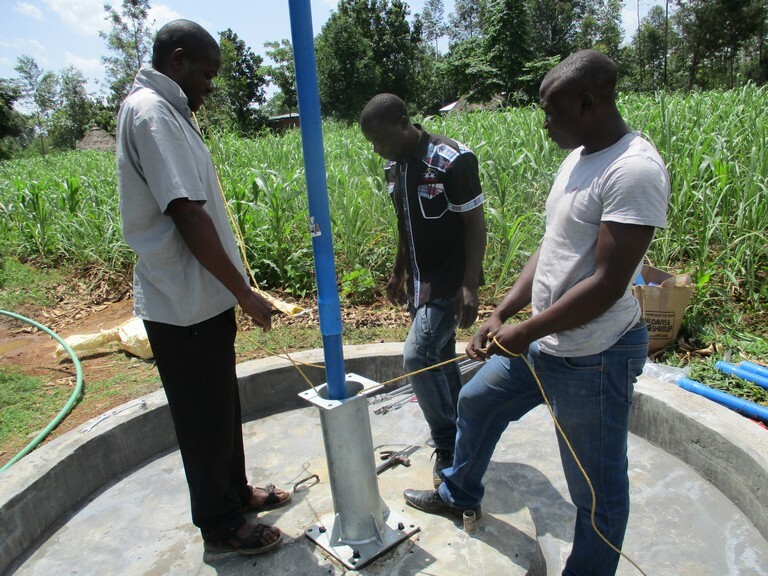 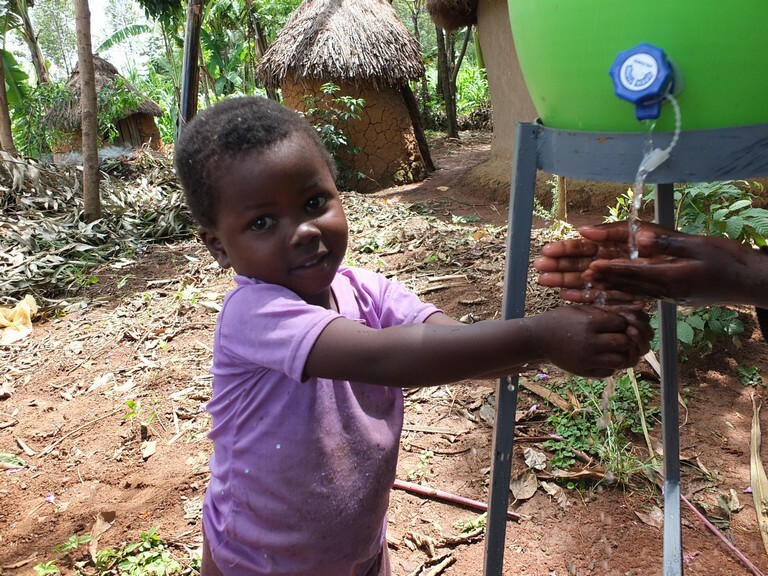 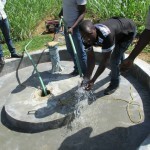 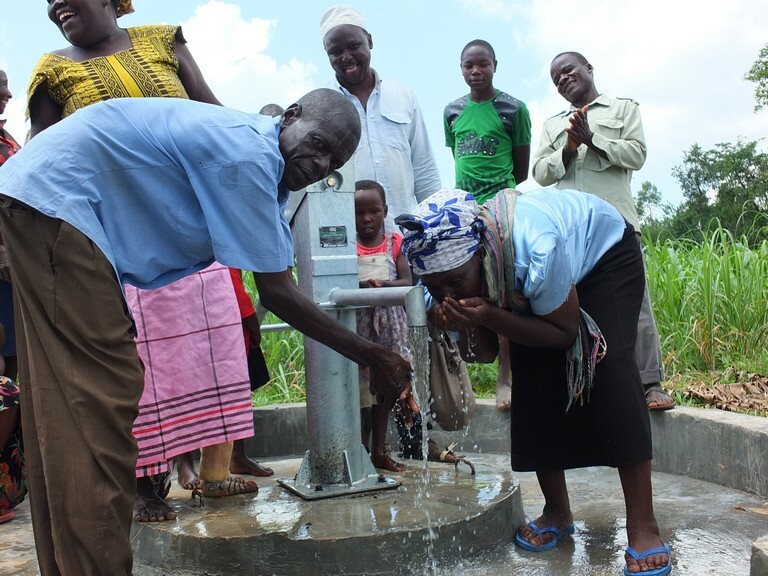 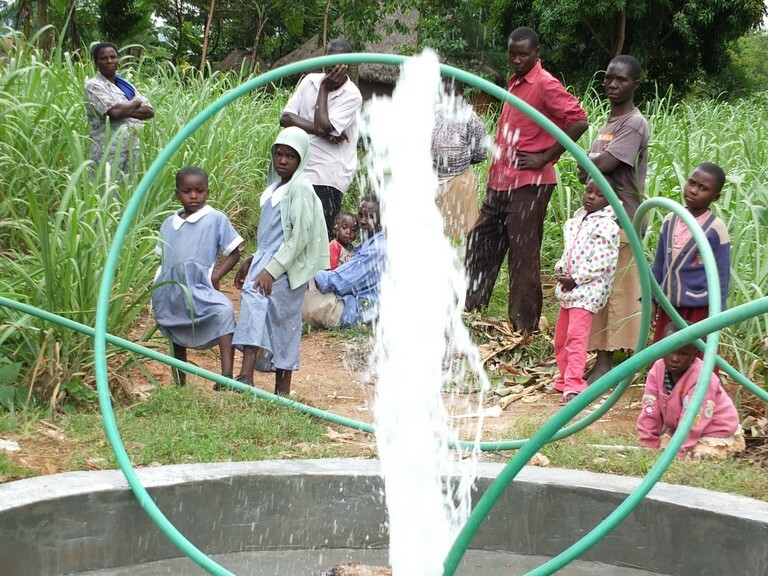 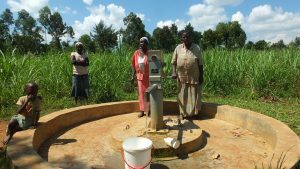 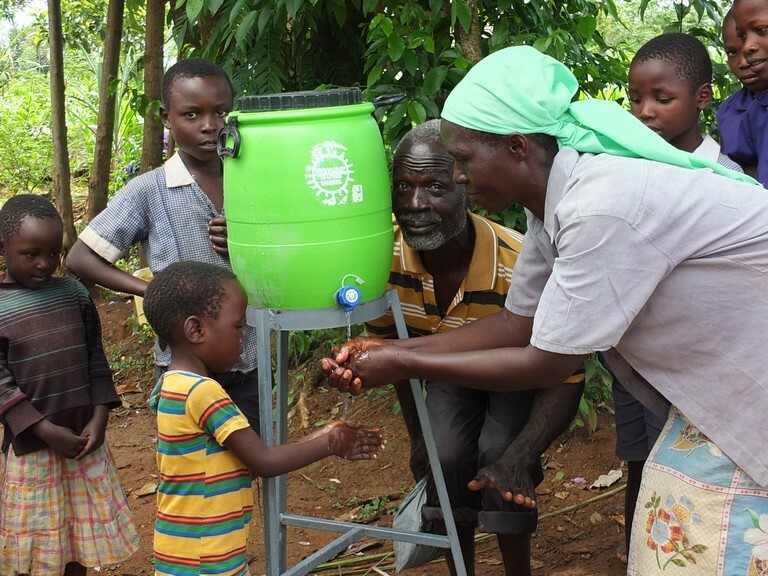 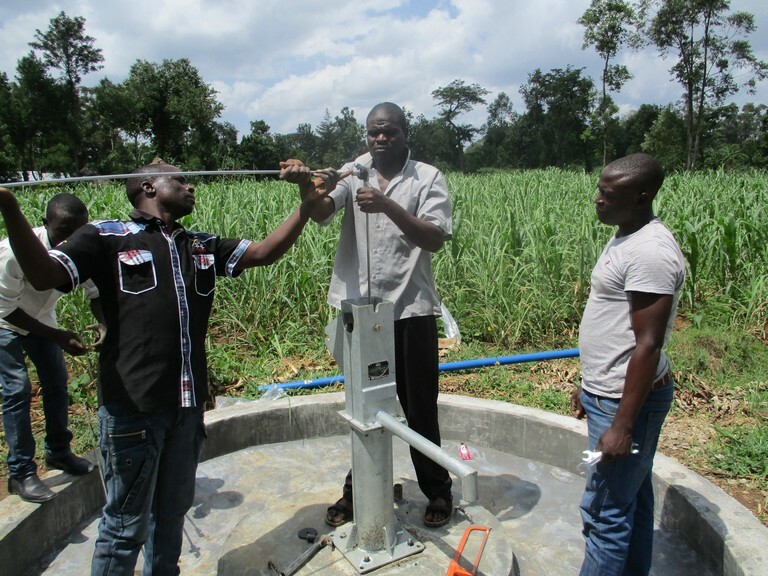 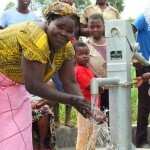 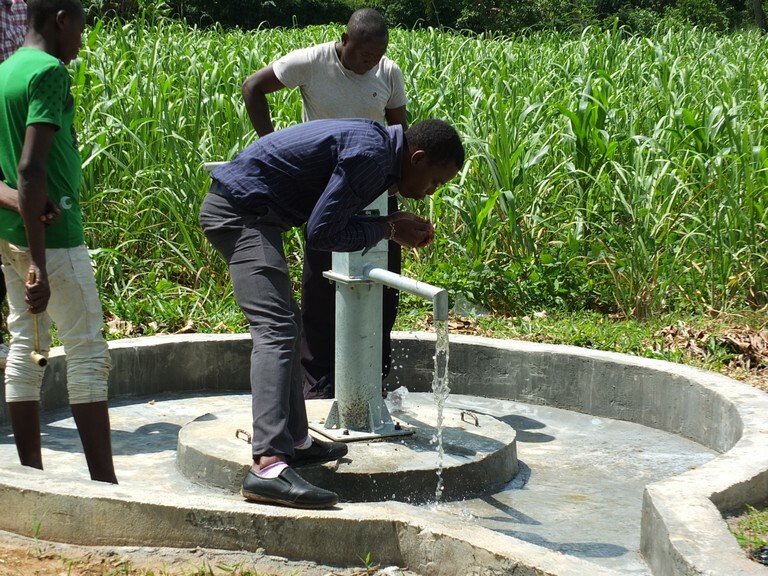 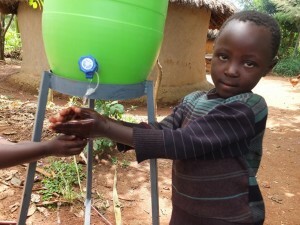 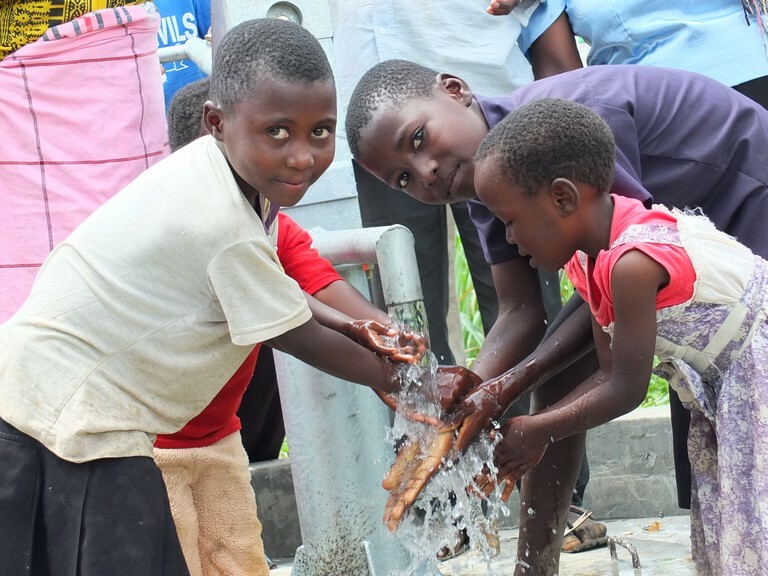 A broken well has been rehabilitated, the community has received training in sanitation and hygiene, and handwashing stations have been installed. 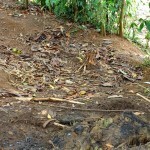 Imagine the change these new resources will bring to this area! 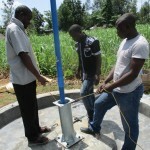 We just updated the project page with the latest details. 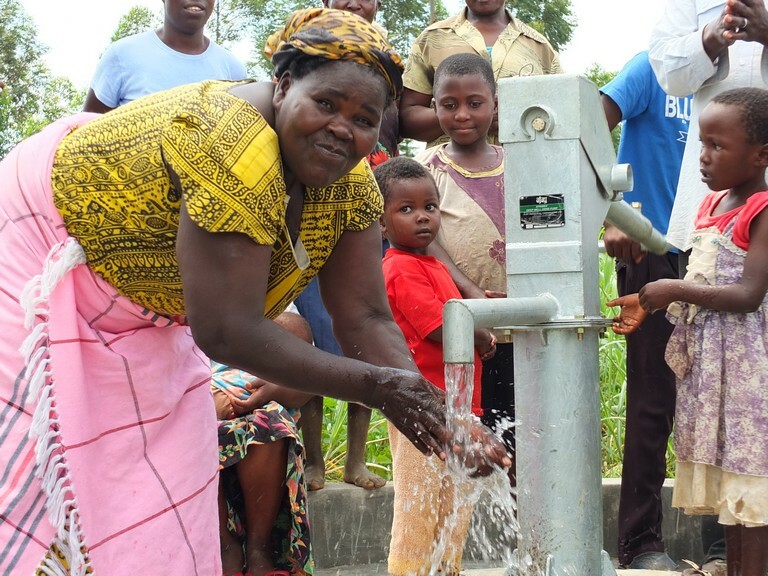 We are excited to announce that, thanks to your willingness to help, Lutinye Community will soon have a new source of safe, clean water. 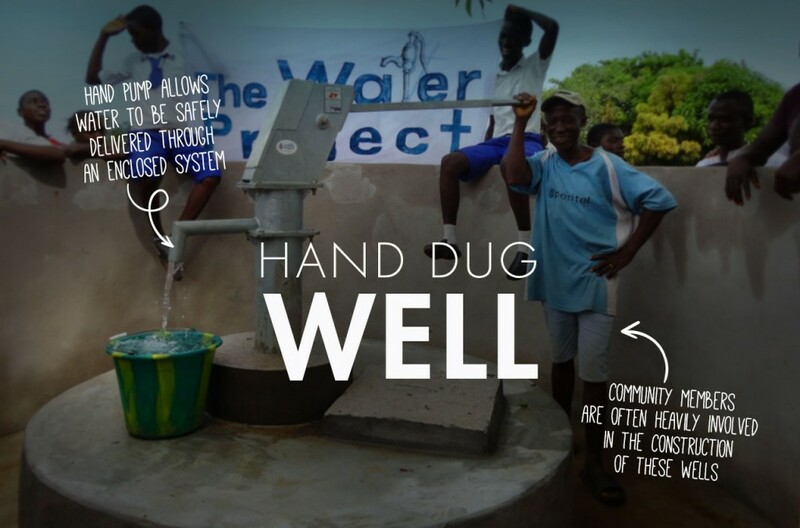 A broken well is being rehabilitated so it will be a reliable resource, and the community will receive training in sanitation and hygiene. 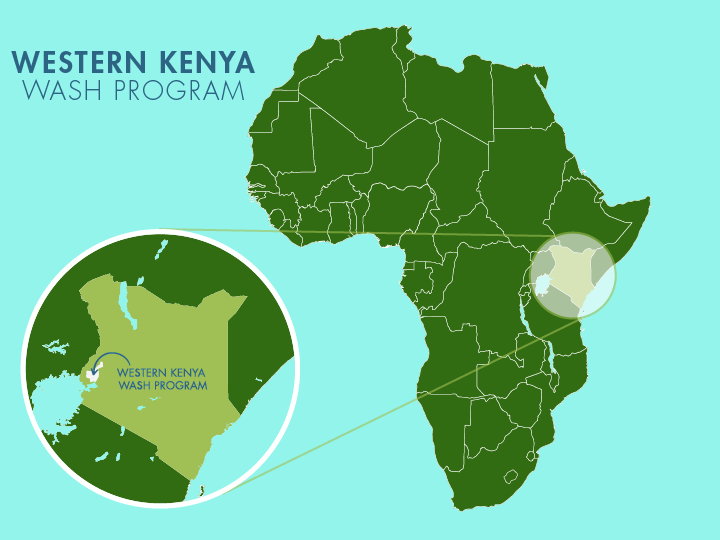 Together these resources will help stop the spread of disease in the area. 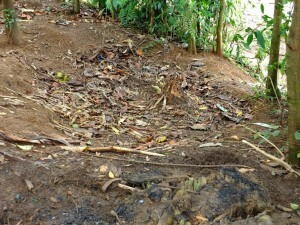 We just posted a report including information about the community, GPS coordinates, and pictures. 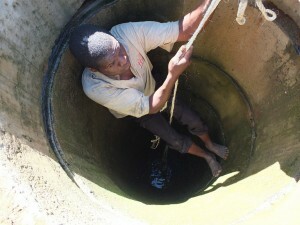 We will keep you posted as work continues. The situation of the outbreak of waterborne diseases was at a high level in this community before the well was rehabilitated. 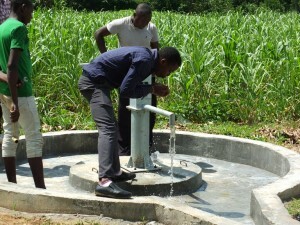 Since the rehabilitation was done, cases of typhoid and diarrhea have been reduced. The situation of the outbreak of waterborne diseases was at a high level in this community before the well was rehabilitated. 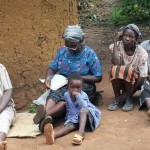 Since the rehabilitation was done, cases of typhoid and diarrhea have been reduced. 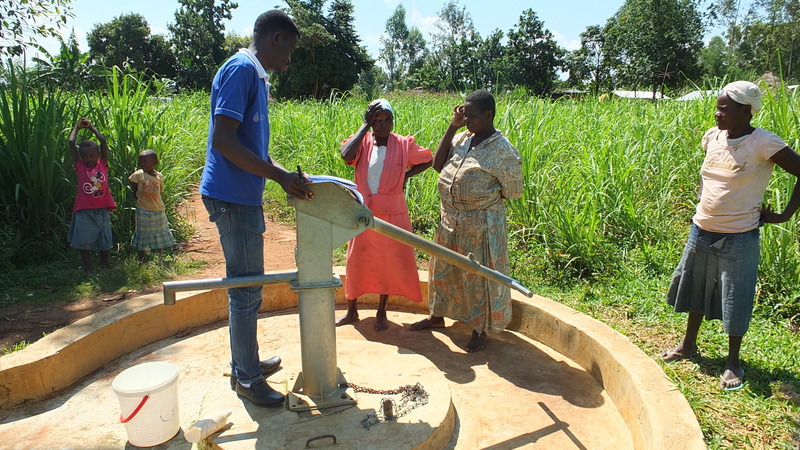 Compared to the previous years where the community used to drink contaminated water from the unprotected springs, there is a big improvement in health since the rehabilitation was done a year ago. 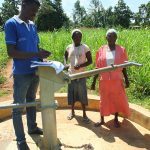 The project is doing well and the community members are positively giving in their monthly contributions for the sustainability of the water project. 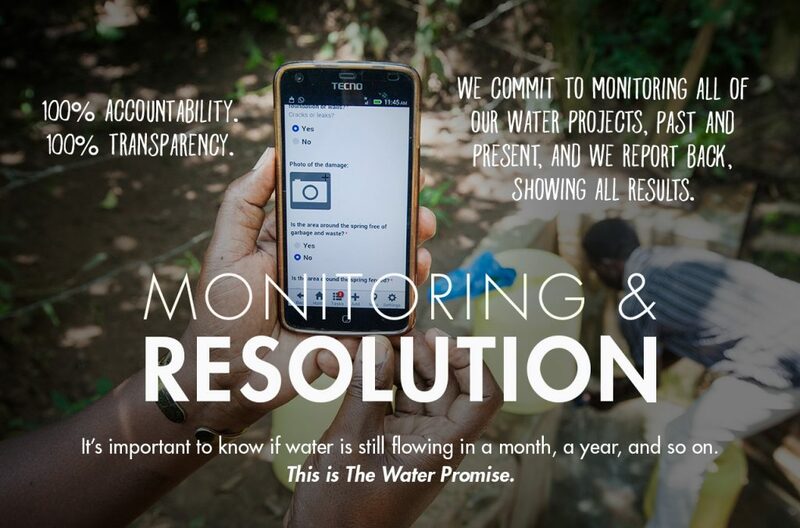 We will continue to monitor this project to ensure a long-term sustainability and maintenance.